The struggle for the legendary sea beast is underway, but how will it end? Drawn into the fight over the narwhal in Kerube, Lawrence finds himself in a dangerous position. Despite this, Holo continues to scold him and plead with him--but why?! 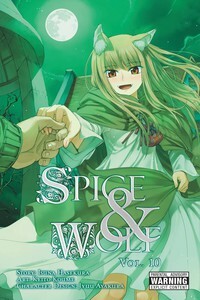 This manga adaptation of Isuna Hasekura's acclaimed Spice & Wolf novel series, also available from Yen Press, is an investment that promises the greatest of entertainment returns!